Lying on the lower levels of two North Shore mountains, a ferry ride across the Burrad Inlet from downtown Vancouver, is North Vancouver, which is divided into two municipalities - city and district. North Van is extremely popular with young families and outdoor activity enthusiasts, as it offers less-expensive homes than Vancouver, in a setting that enjoys amazing natural beauty. 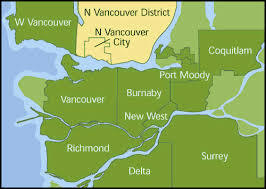 The neighbourhoods are very varied, however, with Lower and Central Lonsdale offering a more urban lifestyle and lots of high-rises and condos, compared with single-family-home neighbourhoods such as Lynn Valley and Seymour, which offer a family-friendly lifestyle and easy access to the local ski hills and world-class trails. In addition, the area includes the delightful historic town of Deep Cove, boasting gorgeous waterfront access to the indian Arm Inlet, as well as charming shops and restaurants.